Apple will announce it’s second quarter of 2011 (Q2 – 2011) financial results on April 20th, 2011. 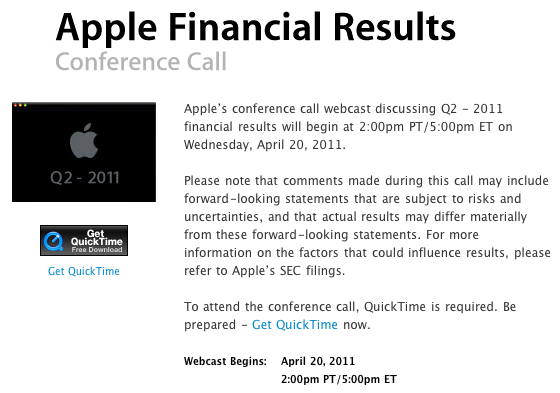 After that Apple will hold a conference call with members of the press. That’s midnight local Saudi time. You can listen to it live on a dedicated page for the call. Please note that comments made during this call may include forward-looking statements that are subject to risks and uncertainties, and that actual results may differ materially from these forward-looking statements. For more information on the factors that could influence results, please refer to Appleâ€™s SEC filings. The results for the last quarter (Q1 – 2011) were: $6 billion profit, $26.7 billion revenue, 7.33 million iPads sold, 19.45 million iPods sold, 16.24 million iPhones sold and 4.13 million Macs sold.